Authorities have released a photo of the vehicle suspected of hitting and killing a bicyclist on Sunday in south-central Iowa. The photo was taken from surveillance video near the scene of the accident on Highway 28 in Norwalk. 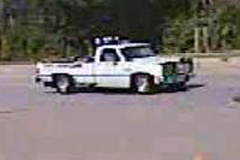 The Warren County Sheriff’s office describes the vehicle as a white 1980s GMC or Chevrolet pickup with a roll bar and attached off-road lights. The front of the truck has a white sign with black lettering. A small piece of the sign was found at the crash site. The pickup is suspected of hitting 54-year-old Mark Grgurich of Des Moines. Authorities says he was thrown more than 100 feet from the bicycle into a ditch. Grgurich died at the scene. Witnesses said the pickup driver was speeding and did not stop to offer help.